Bank of Ireland today announced that its sponsorship agreement with Padraig Harrington will not be renewed when the contract ends in May. The bank entered the sponsorship deal in May 2007 for a three-year term and certainly got value for money as Harrington won three majors in the space of 15 months. But the credit crunch and the fact that Bank of Ireland is now 15.7 per cent directly owned by Irish taxpayers has left some valuable space on Harrington’s chest. Tom Hayes, Chief Executive of Bank of Ireland Corporate Banking, said: “Our decision to sponsor Padraig announced just before the Irish Open in May 2007 has reaped fantastic benefits for our brand. While we were confident that we were partnering with a great golfing talent, he surpassed all our expectations by becoming the first home winner of the Irish Open in 25 years, following which he then went on to win three historic major titles. Harrington is reported to have earned at least €400,000 a year, plus bonuses, from the deal. In return, he wore the Band of Ireland logo on his shirt and did three corporate outings a year - one each in Ireland, the UK and the United States. “I have thoroughly enjoyed working with the Bank of Ireland team, its customers and the many staff who have supported me over the last three years,” said Harrington, who still has deals with Kartel, FTI, Wilson Staff, Titleist, Footjoy, Oceanico, Citizen Eco-Drive, GoS Networks, Marquis Jet, the Marlbrook and White Oak Plantation. Harrington would certainly have been aware of the negative connotation of carrying on the Bank of Ireland sponsorship in the current economic climate. But his loss appears to have worked out well for the Links Golf Society charity, which he has supported for over 20 years. Following the loss of long terms sponsors Renault Ireland at the end of last year, the Links secured a replacement in Bank of Ireland, who supported the 2009 Excellence in Sport Awards, which are organised by the Links. Dublin-based clothing brand Kartel signed Harrington in 1997 and is now the only 100 percent Irish owned company sponsoring the three-time major champion. Padraig Harrington became golf’s $10 million man when he dismissed massive rival offers and signed a new deal with club sponsors Wilson. Ireland’s triple Major champion doubled his money when he closed what is believed to be a three-year deal with the global sporting goods brand at Dublin Castle yesterday. 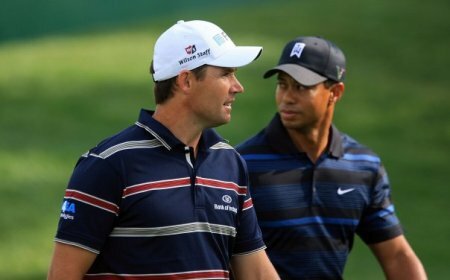 Padraig Harrington is fast becoming Ireland’s answer to Tiger Woods after signing a three-year sponsorship deal for the front of his cap worth a cool $12m. Pádraig Harrington has gifted Irish golf tourism the ultimate mulligan by agreeing to front Fáilte Ireland’s new €1.5m worldwide “marketing blitz” free of charge. Padraig Harrington has extended his deal with Wilson Golf. Picture Stuart Adams /www.golffile.ie Padraig Harrington has re-signed with Wilson Golf but given the economic climate and his dip in form it appears unlikely that three-time major winner has retained the same $10m, three-year deal he landed at the end of his stunning 2008 season.